During his worst slumps, I have stood up for writer-producer-director M. Night Shyamalan as being a magnificent visual storyteller, an artiste, a visionary, a bender (9). But now he’s just a bender (3). In trying to cram THE LAST AIRBENDER with lore from the manga TV series AVATAR: THE LAST AIRBENDER, and in juggling the ubiquitous special effects, it seemed too much for Night to handle, resulting in him having a bender (8). Disjointed, badly-acted and – surprisingly – badly directed, AIRBENDER takes place on a world different from the Earth we know, as it follows a brother and sister from Water Nation, Katara (pert Nicola Peltz) and Sokka (vapid Jackson Rathbone) as they aid the last of the ancient airbenders, young Aang (Noah Ringer) in his quest to unite the five warring Nations, named after the five elements of Water, Air, Fire, Earth and Lame Special Effects. Aang can bend the air to his desire, creating tornadoes, walls of force, lethal destruction, and has the potential to bend all other elements; that’s the power you inherit from having an arrow tattooed on your head. Or something. For the second time in his career, Night has populated his film with non-actors (as in THE HAPPENING), and I’m wondering exactly when he is going to notice. Noah Ringer is the only passable performer in the movie, and rides around on a big furry thing that escaped from Maurice Sendak’s WHERE THE WILD THINGS ARE. The interrelationships between Noah and the other humans are so vapid and uninvolving, we don’t really care what happens to anyone. It’s like Night let someone else direct the interaction between his principals and went off on a bender (4). I feel sorry for Dev Patel, who kickstarted an international career in SLUMDOG MILLIONAIRE, and is now here, traveling the world through special effects and trying to act his way out of them. He plays ostracized Prince Zuko of Fire Nation. Like a bender (1). With his gang from Rydell High School, the T-Birds, he tries to capture Aang and the heart of Olivia Newton-John.Sokka becomes a sucker for Princess Yue and has a kiddie romance with her like a bender (3, 5, 6). Movie throws us a bender (7) when we realize Prince Zuko’s father (ominous Cliff Curtis) has sent out Commander Zhao (THE DAILY SHOW’s Aasif Mandvi) to capture Aang in a race against his own son, which Zhao does with the lust of a bender (2). Night actually leaves us with a cliffhanger – it’s sad and pathetic and a bender (10) all at once – like he will ever get the funding to make a sequel. 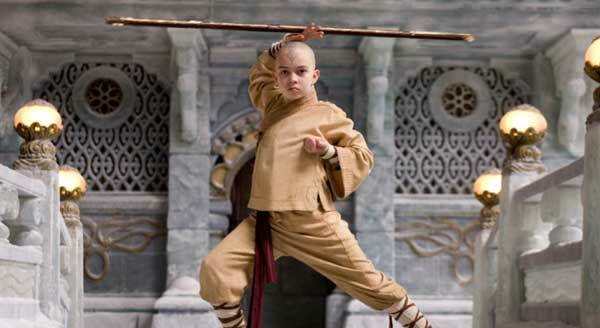 Verdict: M. Night Shyamalan’s THE LAST AIRBENDER is a bender. Know what I mean? aka: AVATAR: THE LAST AIRBENDER. Starring: Dev Patel, Cliff Curtis, Aasif Mandvi, Noah Ringer, Nicola Peltz, Jackson Rathbone, Shaun Toub, Seychelle Gabriel.